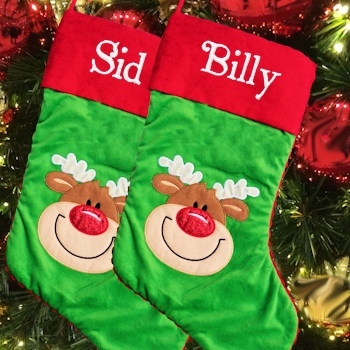 Last One Left.Personalised Rudolph Christmas stocking in red and green. Amys Gifts will personalise this stocking with an embroidered name or initials in your choice of Xmas Print or Fancy Script font. Personalised gifts are customised to order within approximately 3 days.